Astrology is in general terms the observation of the interplay between the planets, including the Sun and the Moon. Even though the Sun and the Moon are considered luminaries (due to their brightness), and not planets, astrologers call the sun and moon planets for the sake of convenience. 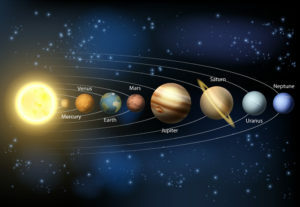 Including planet Earth, astrology deals with 8 planets: Mercury, Venus, Mars, Jupiter, Saturn, Uranus and Neptune. In addition we take into consideration the Sun, the Moon, Chiron and Pluto. Pluto used to be considered a planet, but is now – like Chiron – considered a planetoid or a “dwarf planet”. Even so, Pluto is a super mighty celestial force, so in astrological matters Pluto still plays a major role. Each planet has its precise function in the natal chart, and represents an energetic part of our being, or a component of life, like emotions, communication style, love style etc. The planets can be divided into two classes: personal planets, or fast-moving planets , and collective planets, or slow-moving planets. Personal/fast-moving planets includes the Sun, the Moon, Mercury, Venus and Mars. They are said to be fast-moving due to the relatively short time it takes for these planets to travel the 12 signs of the Zodiac. The speed ranges from 28 days for the Moon, to one year and 220 days for Mars. Because these planets shift relatively quickly from one sign to the other, they release their energies very differently in each individual. Planets that are considered to be collective/slow-moving planets are Jupiter, Saturn, Uranus, Neptune and Pluto. These planets moves a lot slower, and ranges from 12 years for Jupiter to Pluto being the snail of the zodiac taking its sweet time of 249 years to travel through all twelve signs. Due to collective planets remaining in a sign for several years their energies – with the exception of Jupiter and Saturn will affect one or several generations which makes their influence on the individual’s personality is less important.